It became the focus point for everything else on the Eastern Front. Once they battled into the city, the German troops called it the "Rattenkrieg," the "rat’s war," and joked that they had "captured the kitchen but were still fighting for the living room." The joke had more than an element of truth, as the bitter fighting went from block to block, then building to building, and - literally - room to room. Soviet soldiers in the city said, "There is no land on the other side of the Volga." Stalingrad was the living example of the Unstop- pable Force meeting the Immovable Object, as "Advance at all costs!" orders from Hitler ran into "Not a step back!" orders from Stalin. And then came Operation Uranus, when Hitler and Stalin reversed those same orders. But the battle for Stalingrad-the-city was only part of the German 1942 campaign, with its multiple prior- ities of political objectives (like Stalingrad) and resource objectives (like the Caucasus). Now, you can face the same questions and try to do better. Each player will take the role of the operational theater commander. You still have leaders with short names and shorter tempers looking over your shoulder and telling you want to do (handled in game terms with directives and pro- cedures that turn your decision making choices as much into "How do I please him?" as "How do I beat the enemy?") 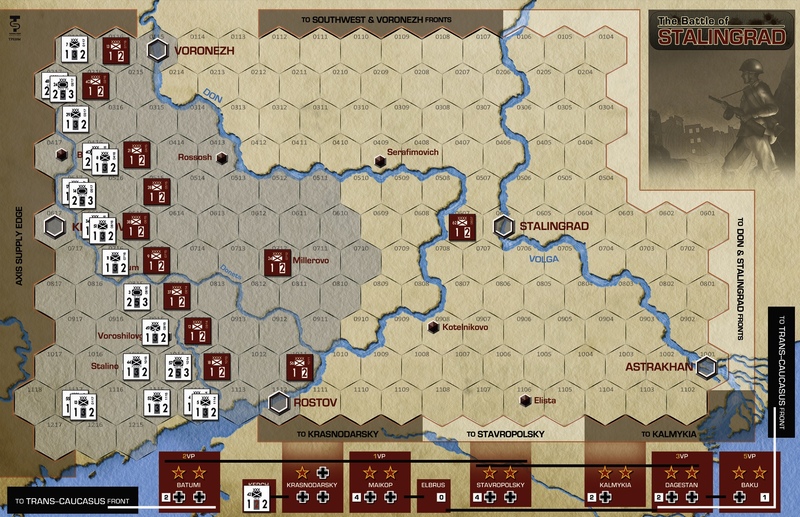 Counters represent mostly Soviet armies and German corps, with "assets" that can be attached to both, and minor Axis allies represented as well. Map scale is 55km to the hex, with 2 turns per month. Now, you can revisit one of the most bitter cam- paigns of the war, in a challenging game you can play in a single sitting. The Battle of Stalingrad puts you in charge where a whole region is aflame, leading up to the bitter fight- ing in the city and what was a true turning point of the entire war. The choices are up to you! 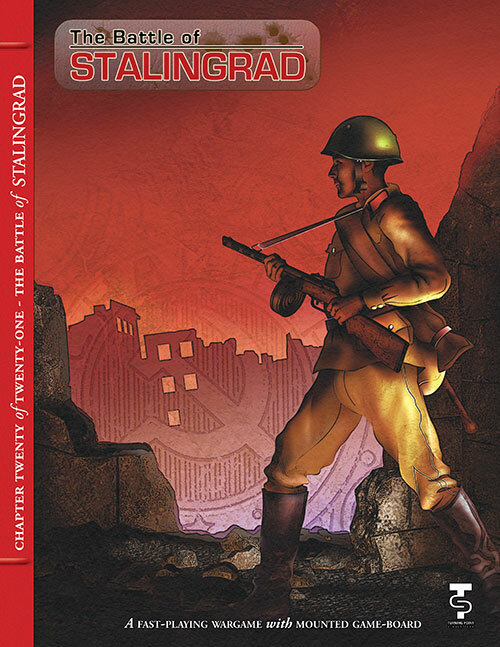 The Battle of Stalingrad manages to provide mon- ster game nuances in a game small in size with innovative design. For example, the sequence of play is not the same for each side. And why should it be? The Axis and Soviet armies do not do the same tasks each turn, because their armies operated differently. The Soviet player actually allocates supplies as he sees fit. Does he reward success or try to stave off defeat? Both players use Tactical and Strategic movement, as they move their forces around the battlefield. German Primary and Secondary objectives are determined randomly (and hidden from the Soviets!). Side operations in the Caucasus offer additional victory points but occupy units to achieve them. Are the points worth the cost? Operation Uranus, the great Soviet counteroffen- sive, has optional start times, with incentives for delay (if the rest of the Soviet front can hold out!). Sudden death victory is possible for both sides, encouraging that extra effort that could win it all...or leave one exposed and exhausted. At the end of the game, key point adjustments and multipliers get factored in and compared. Short of the Sudden Death victory, which side really "wins" can be in doubt to the very end. As it should be, in a situation like this. That means straightforward rules, key insights into the history behind the game, and designs aimed at one-session conclusions and high replay value. 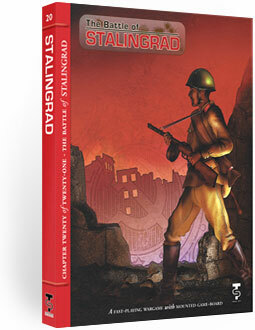 With shifting objectives and variable entry times for key units, no two Stalingrad games will play the same. About the Designer: The designer of this game is Hjalmar Gerber. He says "designing is fun. The real works is done by the developers, testers and proofreaders; and let us not forget the artist who makes a game look better than I can imagine it. "